Andrew Yun Wins Pac-12 Championship; Stanford Finishes Sixth. Andrew closes with a 68 to earn a two-shot victory over Daniel Miernicki of Oregon. 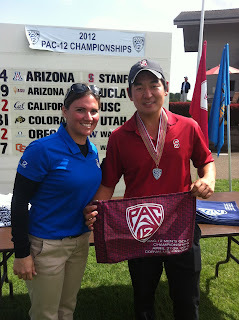 Andrew had 22 birdies and an eagle over 72 holes at the Pac-12 Championships. 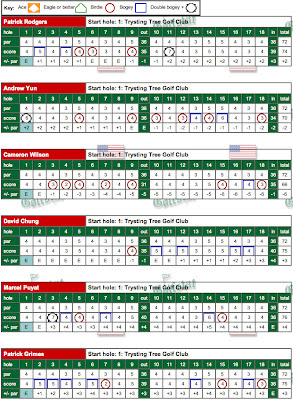 Final round scorecards and prior round results are shown below. Andrew Yun shot a final round 68 to claim medalist honors at the Pac-12 Championships at the Trysting Tree Golf Club in Corvallis, Ore. on Sunday. The Cardinal finished sixth in the team event at 1467 (+8), 20 strokes behind California, which claimed the team title with a playoff victory over Oregon. Yun's 72 hole total of 68-70-67-68 275 (-13) was good for a two stroke victory over Daniel Miernicki of Oregon, who shot a final round 71. 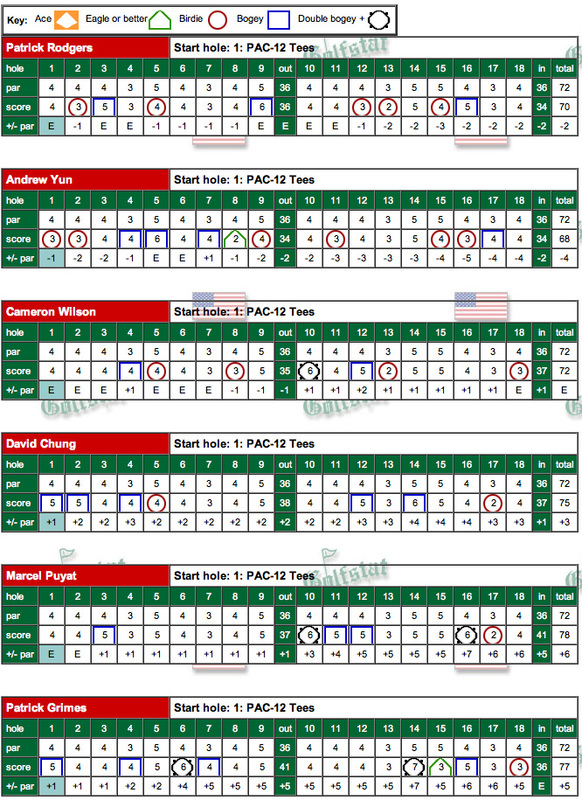 Sam Smith of USC and Eugene Wong of Oregon tied for third at 279 (-9). Yun set the tone for his round with birdies on his first two holes. However, after collecting a par on the par-4 third hole, Yun bogeyed three of his next four holes to slip back to +1 on the day. An eagle on the par-4 eighth followed by a birdie on the par-5 ninth allowed Yun to make the turn at two-under. He picked up three more birdies on the backside on holes, 11, 15 and 16 before dropping a stroke with a bogey on No. 17 to close with a 68. 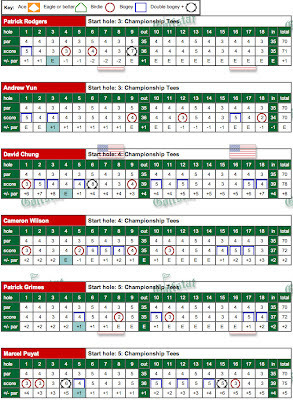 Yun had 22 birdies and an eagle for the 72 hole event to become the first Stanford golfer to claim conference medalist honors since Jim Seki in 2002 on the same Trysting Tree layout. Andrew is interviewed below after his final round. Patrick Rodgers (73-74-65-70), who started his final round tied for sixth place after a brilliant 65 on Saturday, settled for an eighth place finish after closing with a 70 on Sunday. Rodgers had five birdies and three bogeys on his Sunday card to finish at 282 (-6) for the event. Cameron Wilson had a final round even par 72 and a solid 3 rounds of 2-under par play (76-66-DQ-72 214) marred by his failure to sign a correct scorecard in round 3. 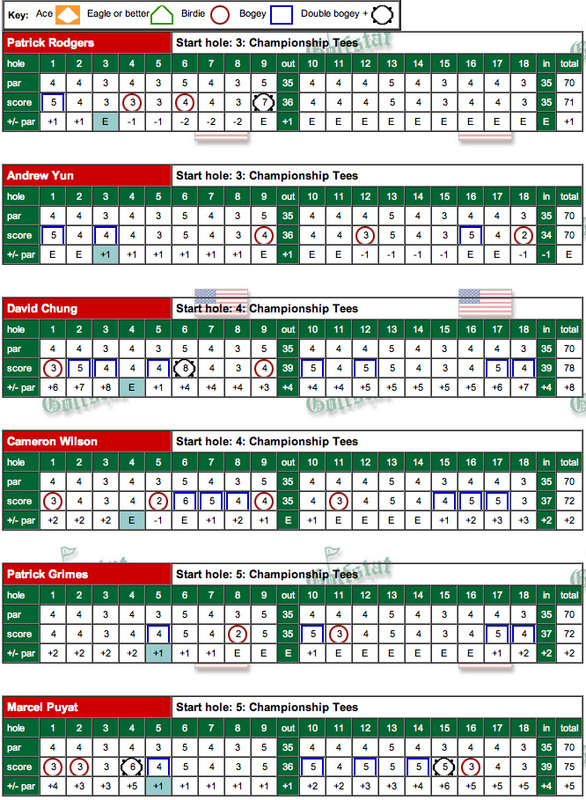 Senior David Chung tied for 47th at (79-75-72-75) 301 (+13) after shooting a final round 75. Marcel Puyat (77-76-74-78) and Patrick Grimes (82-75-73-77), playing in their first Pac-12 Championship event, tied for 59th and 62nd place, respectively. Puyat shot a final round 78 to finish at 305 (+17) while Grimes' final round 7 left him at 307 (+19) for the tournament. Stanford will host the NCAA West Regional, May 17-19 at Stanford Golf Course. The top five teams from the event will advance to the NCAA Championships at the Riveria Country Club in Pacific Palisades. 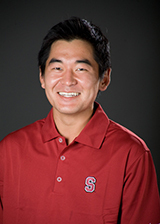 CORVALLIS, Ore. - Stanford is in sixth place after three rounds of the Pac-12 Championships being held at the Trysting Tree Golf Club in Corvallis, Ore. while junior Andrew Yun is just one stroke off the individual lead heading into Sunday's final round. The Cardinal shot a 353 on Saturday and at 1086 (+6), is 20 strokes off the pace being set by Oregon, which enjoys a four-stroke lead over UCLA after three rounds. California is in third place at 1072 (-8) followed by Oregon State and USC at even par 1080. Yun birdied his last five holes on Saturday en route to a third round 69, leaving him at 207 (-9) for the first 54 holes. He is one stroke behind co-leaders Daniel Mierniecki and Eugene Wong of Oregon while Patrick Cantlay of UCLA is lurking at 210 (-6). Yun was two-over on his round after 13 holes before closing with five straight birdies for a third round 69. However, the team's low round of the day belonged to freshman Patrick Rodgers, who fashioned a brilliant third round 65 to move into a tie for sixth place at 212 (-4). Starting on hole 10, Rodgers birdied four of his first six holes and picked up another birdie on the par-4 first hole to start his second nine. After giving a stroke back with a bogey on his 13th hole, Rodgers made consecutive birdies on his 14th and 15th holes and closed with a birdie on 18. David Chung is tied for 48th at 226 (+10) after battling to an even par 72, which included a triple bogey 7 on his ninth hole of the day. However, Chung birdied three of his last four holes to finish at even for the day. Freshman Marcel Puyat is tied for 53rd at 227 (+11) after a third round 74 while fellow frosh Patrick Grimes is in 63rd place at 230 (+14) after shooting a 76 on Saturday. Cameron Wilson, who was tied for seventh place after two rounds, was disqualified after signing an incorrect scorecard. The Pac-12 Championships will conclude on Sunday at Trysting Tree Golf Club in Corvallis. ROUND 1 & 2 RESULTS - gostanford.com story below. Stanford Tied for Sixth After Two Rounds of Pac-12 Championships. 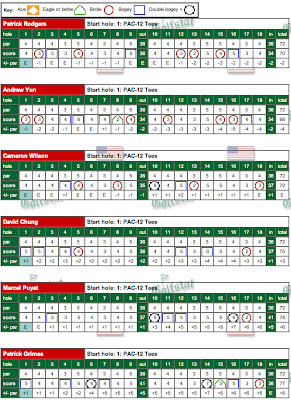 Cardinal 14 strokes behind UCLA; Yun one stroke off the lead. Stanford's men's golf team is tied for sixth place after two rounds of the Pac-12 Championships being held at Trysting Tree Golf Club in Corvallis after the Cardinal turned in scores of 373 and 360 on Friday. At 733 (+13), the Cardinal and Washington State are 14 strokes behind UCLA after the Bruins turned in rounds of 367 and 352 to build a three stroke lead over Oregon (722). California (724) and USC are tied for third, followed by Oregon State at 727. 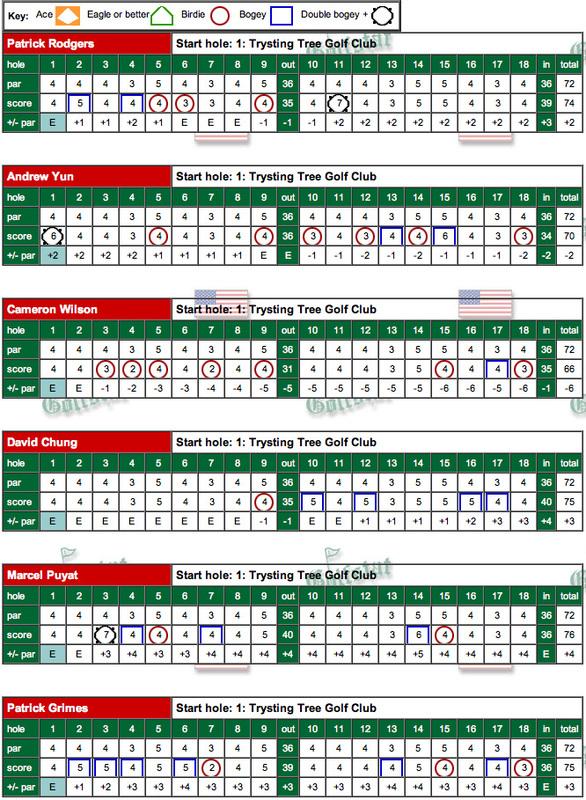 Andrew Yun is in second place after 36 holes after the junior posted rounds of 68 and 70 at Trysting Tree. He is one stroke off the pace being set by Eugene Wong of Oregon, who shot rounds of 69 and 68 on Friday. Yun was even par after 10 holes on his morning round before running off four straight birdies. He picked up another birdie on the par-3 17th hole only to bogey the 18th to finish with a 68. He began his second round with a double bogey on the first hole but then picked up birdies on 5, 9, 10 and 12 to move to three-under on his round. After a bogey on 13, Yun birdied the par-5 14th, bogeyed 16 but closed with a birdie on 18. After an opening round 76, sophomore Cameron Wilson blistered Trysting Tree to shoot a 66 over his second 18. He had five birdies on the front side and moved to minus-6 on his round after a birdie on 15. Wilson made his only bogey on 17 but closed with a birdie on 18 for a brilliant 66. Freshman Patrick Rodgers had a hard time getting anything going on Friday and had to settle for rounds of 73 and 74. At 147, the nation's third-ranked player is tied for 28th. Rodgers was one-under on his afternoon round through 10 holes but suffered a triple bogey on the par-4 11th hole. Freshman Marcel Puyat shot rounds of 77 and 76 and is tied for 57th at 153. Senior David Chung is tied for 61st at 154 after rounds of 79 and 75, while freshman Patrick Grimes is tied for 67 at 157 (82-75). Cardinal searches for first conference title since 1994. Patrick Rodgers is coming off a first place finish at the Western Intercollegiate, his second win of the season. 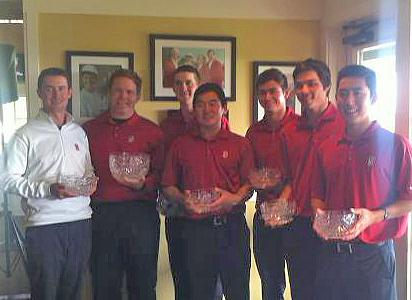 The six man Stanford squad will include Rodgers, Andrew Yun, Cameron Wilson, David Chung, Patrick Grimes & Marcel Puyat. STANFORD, Calif. - Stanford's men's golf team heads to the Trysting Tree Golf Club in Corvallis, Ore. this weekend in search of a title that has eluded the Cardinal since 1994 - the Pac-12 Championship. Technically, this is the inaugural Pac-12 Conference Championship, but history shows winning a conference title has proven to be more difficult for the Cardinal than winning a NCAA Championship. The Cardinal will begin its quest for the elusive conference title on Friday at Trysting Tree Golf Club, where the championship will be decided over 72-holes of stroke play. Teams will play 36 holes on Friday and 18 on Saturday and Sunday. Six golfers from each team will account for five scores. USC is the defending champion, winning last year's title at Stanford Golf Course. USC's Matt Trainer won medalist honors in a seven-hole playoff over Oregon State's Alex Moore. Six of the 12 teams in the field are currently ranked among the nation's top-12 according to the Golfweek/Sagarin ratings, including No. 3 UCLA, No. 5 USC, No. 6 Stanford, No. 7 California, No. 10 Oregon and No. 12 Washington. A total of 15 players are listed among the nation's Top 50 players, including Stanford's Patrick Rodgers, who is ranked third nationally in the latest individual listing released by Golfweek. Knowles Family Director of Golf Conrad Ray is expected to start a lineup consisting of Rodgers, Andrew Yun, David Chung, Cameron Wilson, Marcel Puyat and Patrick Grimes. Rodgers is coming off his second win of the season at the Western Intercollegiate, where he claimed a two-stroke victory over two golfers, including UCLA's Patrick Cantlay. Rodgers, a semifinalist for the Ben Hogan Award, has seven top-10 finishes this season, including two wins. In addition winning the Blue Jacket at Pasatiempo, Rodgers claimed medalist honors in his first collegiate event at the Fighting Illini Invitational in September. With a stroke average of 70.8, he is challenging Joel Kribel's single-season school record of 70.1, set in 1999. Tiger Woods is the only other Stanford golfer to post a stroke average under 71.0, as he finished with a mark of 70.6 for the 1995-96 season. Junior Andrew Yun, currently ranked 19th by Golfweek, is coming off back-to-back top-10's at the U.S. Intercollegiate (t-10) and the Western Intercollegiate (t-4), two of five top-10's this season. While Rodgers and Yun have been mainstays at the top of the lineup all season, Stanford's depth will be put to the test in this 72-hole, six count five tournament. Wilson is coming off a 10th place finish at the Western Intercollegiate, where he finished one-over par after rounds of 69, 72 and 70. Chung has finished inside the top-20 just twice this year but has three years of conference championship experience in his bag, along with titles at the 2010 North & South and Western Amateurs. Grimes and Puyat have been playing some of their best golf of the season as of late. Grimes tied for 17th at the U.S. Intercollegiate after shooting rounds of 72, 72 and 71. He also opened with a 66 to tie for the first round lead at the Amer Ari Invitational, held on the Big Island in February. Puyat has appeared in five tournaments this season, but carded a five-under 211 to tie for 17th at The Prestige at PGA West in his collegiate debut. He also tied for 19th at the U.S. Intercollegiate and tied for 25th at the Western Intercollegiate. April 15, 2012 - article below by gostanford.com | Facebook Photos/Videos | Excellent Stanford Daily article | Good article by local paper, Santa Cruz Sentinel | Golf Week Summary & Rankings | Tournament Website | Pasatiempo Golf Club Website | Scoring by GolfStat. Final round scorecards and round 1 & 2 results are below. Patrick Rodgers was the individual winner, Andrew Yun finished 4th and Cameron Wilson finished tied for 7th. Pasatiempo GC, designed by Alistair MacKenzie, is one of the top-rated courses in the world and features fast, undulating greens and tight driving holes. The course is about an hour from the Stanford campus. 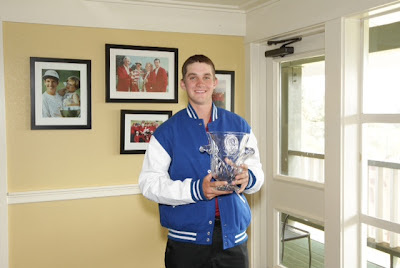 SANTA CRUZ, Calif. -- - Patrick Rodgers shot a final round 68 to capture the 66th Annual Western Intercollegiate at the Pasatiempo Golf Club in Santa Cruz. Patrick had a bogey free final round closing with a 33 on the tough back nine after birdies at 13 and 18. Rodgers' 54-hole total of 206 (-4) earned the freshman a two-stroke victory over UCLA's Patrick Cantlay and New Mexico State's Justin Shinn, who finished at 208 (-2). Stanford finished second in the team standings at 1064 (+14), four strokes off the pace of top-ranked Texas (1060). UCLA (1067), USC (1089), California (1100) and Oregon (1103) rounded out the top five. The title is Rodgers' second of the year after following his win at the Fighting Illini Invitational in September, his first collegiate event. He has also finished in the top-10 in eight of his nine tournaments in his rookie year. Patrick's final birdie putt on 18 to seal the win is below. The Avon, Ind. native had 16 pars on his Sunday's card to go along with two birdies on he par-5 13th hole and the par-3 18th. “Obviously, I know there is a lot of history behind this tournament and Pasatiempo is a great golf course," said Rodgers. "To be able to come through this week with such a great field that includes the top three amateurs in the world, it feels really great. Junior Andrew Yun fired a closing round 69 to secure a fourth place finish at 209 (-1. He was even par on his round after seven holes but double bogeyed the par-3 8th hole before picking up clutch birdies on holes 9, 13 and 18. Sophomore Cameron notched a top-10 finish, tying for seventh at 211 (+1). He shot an even par 70 on Sunday with three birdies and three bogeys. 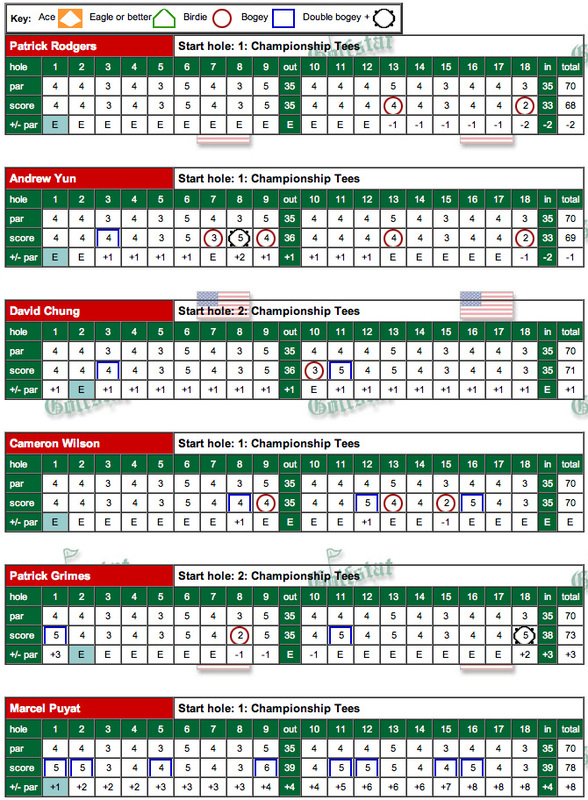 David Chung and Patrick Grimes tied for 42nd at 224 (+14). Chung shot a final round 71 while Grimes carded a 73. Freshman Marcel Puyat's final round 78 left him tied for 45th at 225. Wilson Bowen, playing as an individual, tied for 56th (+19) after turning in a 75 on Sunday. SANTA CRUZ, Calif. -- - Stanford's men's golf team finds itself in second place after two rounds of the 66th Annual Western Intercollegiate being held at the Pasatiempo Golf Club in Santa Cruz after the Cardinal shot rounds of 353 and 360 on Saturday. At 713 (+10), Stanford trails first place and top-ranked Texas by eight strokes after the Longhorns posted rounds of 355 and 350 for an even par total of 705. UCLA is in third place at 715, followed by USC (722) and California (735). Six players account for five scores in this 54-hole event which will wrap up on Sunday. Second round play was suspended a little after 8:00 p.m. with a handful of players still on the course. Freshman Patrick Rodgers carded rounds of 67 and 71 on the Alister MacKenzie-designed course and sits in second place at 138, one stroke off the pace being set by New Mexico State's Justin Shin, who is at 137 after rounds of 68 and 69. After his superb 67 in round 1, Patrick's solid 2nd round of 71 was only marred by one over par hole, the par 5 9th hole where he had a double bogey 7. Longhorn top guns Jordan Spieth (139) and Dylan Fritelli (140) are also in the title hunt, as is UCLA's Patrick Cantlay, who is part of a group at at even par. Rodgers' morning card featured four birdies and one bogey. He got to -5 early in his second round, picking up birdies on holes 4 and 6, but made a double bogey on the par-4 ninth hole. Rodgers then rattled off nine straight pars before making a bogey on No. 1, his 17th hole of the round after starting on No. 3. Andrew Yun, who narrowly missed winning the Blue Jacket last year, shot two rounds of even par 70 and is tied for fourth place at 140. Cameron Wilson followed a -1 69 with a 72 in the afternoon and is tied for ninth at 141. Freshman Marcel Puyat is tied for 25th at 147 after rounds of 72 and 75, while fellow frosh Patrick Grimes is tied for 50th at 151 after rounds of 79 and 72. Senior David Chung is tied for 58th at 153 (75-78) while Wilson Bowen, playing as an individual, is tied for 61st at 164 (81-73).